I wonder if Stuart Roy Clark would allow us to use A Crack at Belle Vue? Cracking shot but I doubt we'd get permission. I quite like this shot too but it would be a question of sourcing a decent copy. It appeared in the newspapers so it's probably owned by Getty Images or someone like that. 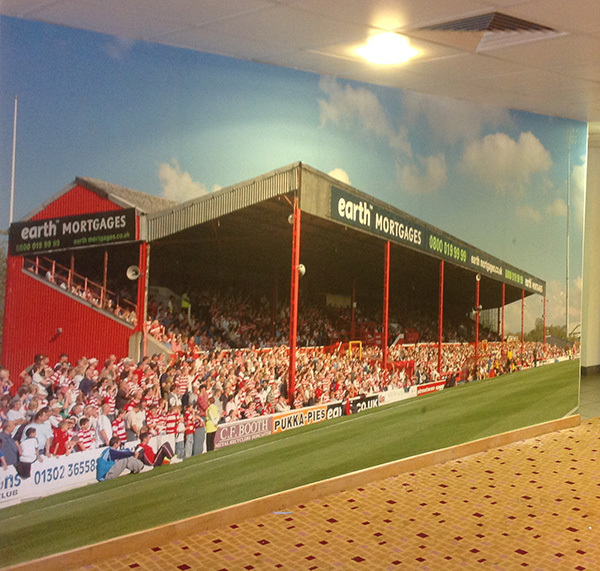 If there is a shortlist of photos, maybe it should go to a vote as to which one(s) should adorn the Belle Vue Bar. I close my eyes and i can imagine every little detail in the place, the saturday kick off's and the night matches that for me were the best, under the floodlights you couldn't see the imperfections only the beauty of the old girl. For anyone who is considering donating to this project we will be closing donations on Wednesday 29th July to give us enough time to get the wallpaper up by the first league game on the 8th August. Paid up, its worth it for the memories. How we doing? Have we covered it yet? We've extended the deadline for donations to 12pm today! Don't miss out on this last chance! Thanks to everyone who donated to this project! Due to reasons outside of our control there has been a small delay and unfortunately the wallpaper won't be up for this Saturday. We'll contact each donor individually to keep you up-to-date with progress. hi vsc supporter we paid the £50 business donation but did not find how to put in our business name on ready for the printers. If we are to late no problem we will accept whats is printed kind regards builder jon. I take it you didn, t want the ariel photo as you never replied to me after I sent it to you. Sorry for the mix up. We did get your email but we'll be using some different images. Thanks. 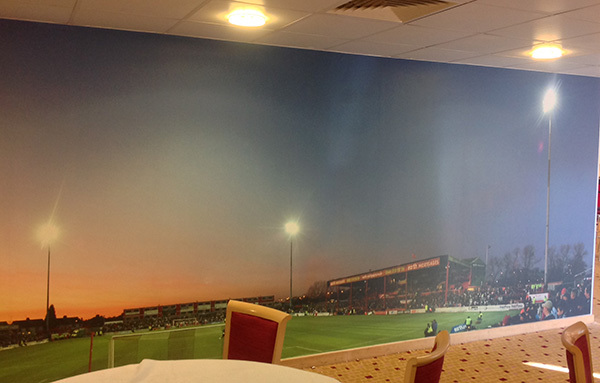 After a bit of a delay at the printers we finally managed to get the wallpaper up, and we think it looks fantastic! Remember to leave the name you would like printing on the wall in the message box. You don't need a PayPal account to donate either; just click the button above and then click the continue link under "Don't have a PayPal account?" to enter your card details. Thanks go to Steve Uttley and Mike Floate for the images. 10 points to anyone who can guess the matches they were taken at? Hey I'm on that bottom picture! I can't see any names on the pics, do we have to fetch our own felt pens? We're having a plaque made for the next home game. Looks like we're kicking towards Rosso end so I'll be up tother end. Are you sure it's not a dream BB? Is the top one the last league fixture at BV, at half time? Carlisle, last game of the Div 3 Championship season.